Big data and Industrial Internet of Things (IIoT) are relevant topics of discussion in many commercial and industrial applications, and it also applies to the operation of refineries and petrochemical plants using analyzed data to improve operations. Online data from sensors, whether wired or wireless, can be analyzed and used to provide plant operators with the actionable information to make timely decisions for improving asset reliability and efficient operations. Properly trained operations are invaluable in this process, as they not only act on information from analyzed data, but can also make decisions on their own based on sensor data. Online data from sensors has been available for decades, but a transformation is now taking place due to the low cost and quick installation time for WirelessHART® (an international industry standard IEC 62591 since 2010) sensors when compared to their wired counterparts. The term pervasive sensing describes the application of wireless sensors to areas which were formerly too expensive to monitor with wired instruments, leading to the creation of big data. Abnormal operation can quickly be identified and corrected with properly trained staff to act on this new timely analyzed information. Big data and IIoT will continue to have a role with shortages of skilled resources, thus having the staff be more efficient and effective at their role with additional information and insight into operations. 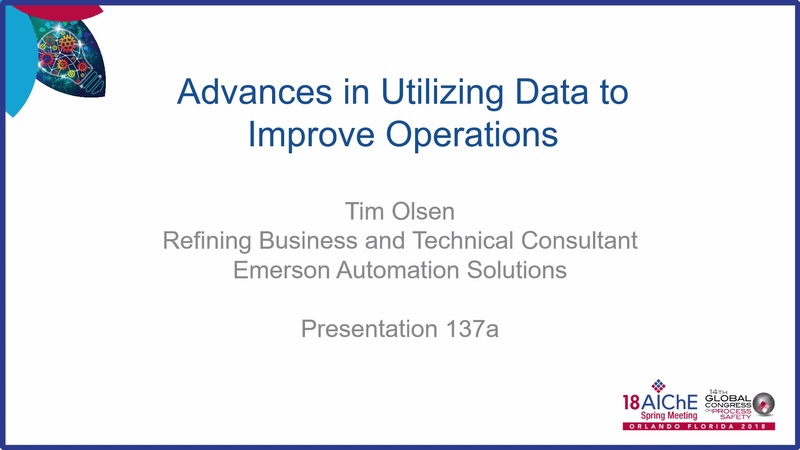 This presentation will focus on the applications where big data and IIoT have improved operations. Although the applications presented will come from oil refineries, the solutions can be applied to other continuous processing facilities.